I have a blown B160 in a Cantor III, SP1095 to be specific. I plan to rebuild it. I know, not an easy task, but looks feasible. Any help regarding this driver or a close relative would be appreciated. Thanks. I plan on posting the results of the rebuild in this thread. Stay tuned. Life is better on a tennis court. What exactly is broken? Obviously all the information you are asking for will be somewhere in the KEF drawing office in Maidstone, but do you actually need all of it? There is a short in the wires. When it went, there was a slight smell of burnt material. So far I've detached the surround from the basket, and although I took hours to try to save it, I don't expect it will perform as well if I don't replace it. After carefully inspecting how the spider is attached, I don't expect to be able to do much better to salvage it either. I've searched for replacement parts without success. I found some B200 surrounds (which I purchased to replace the ones on my passive radiators), but nothing for the B160. This means I'll need to find a replacement spider and surround based on spec. I can measure on the unit, but that's plan B, as nothing beats the spec source. Then comes the wire. Measuring the gauge will require that I strip the coating and either find a high-precision tool (probably at a local machine shop) or that I tightly wrap the entire length around a small cylinder, measure the total width and then divide by the number of turns. Again, these two approaches are respectively plan B and C, as nothing beats the original spec. As for the winding pattern, depending on how messy the wire looks when I open it up, I may or may not be able to get an exact read on the number of turns. I'm hoping the number of layers will be possible to observe, although that is not guaranteed. Finally comes the coil cylinder itself. I hope it will be salvageable, but if someone has access to the original specs for the unit, just in case it is not, the inner or outer diameter plus material thickness would be needed to rebuild. Length would also be useful although I'm less worried about that ... but hey, if someone has it I'm all ears. The cone looks good, and the basket is in top shape. I tried attaching an image showing the condition of the detached surround but I guess I'll need to read-up on how to get that done in a forum (yip, at 50+ I'm a total newbie at posting in forums; never too late I guess!). Here's the pic of the driver showing the detached surround. Just a bit of dust (some ongoing renovations in the house). have a look at http://www.hifiloudspeakers.info/speakertalk/viewtopic.php?t=1751 for general last resort stuff regarding trying to save everything you can before attempting a rebuild. If the old voice coil is fried, then you'll need to re-wind one or find something via ebay or similar. You will have to estimate the winding from whatever measurements you can make while dismantling. If the other channel is good then you will know the d.c. resistance to aim for. Early KEF coils were wound with an inside diameter to clear a 1.000" polepiece by about 0.007" radially. The winding was always two layers and 0.5" long in a 0.25" magnet gap (thickness of to[ plate) or later often a 10mm winding with a 5mm thick top plate. You can calculate the wire gauge from the wind dimensions and the required d.c. R. from first principles. Wire gauges were B.S. with grade 1 coatings. Plenty to go on without drawings but you will need calipers and a micrometer. A friend with a lathe would be good too. Good luck. I'll have to read up on calculating the gauge, as I'm not familiar with the principles. Thanks for pointing me in that direction. As a side note, after months of on and off research preparing for this project, I have never seen a video or read a text with the presence of a card ring between the surround and basket. Is this specific to KEF, the period these were built, or other? Just curious. 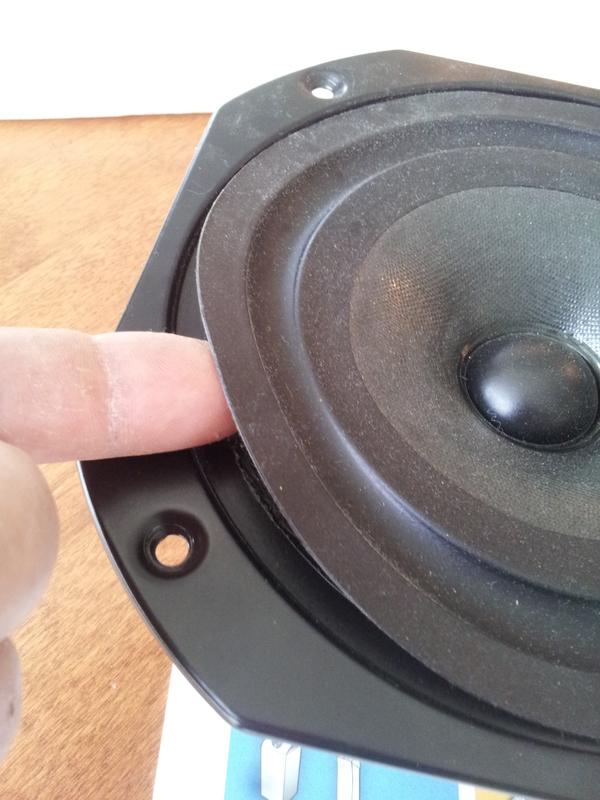 The pvc surround material was very difficult to stick using the adhesives of that era. Vacuum-forming and sticking to card which could then be stuck to the chassis was a very effective workaround. The card also helped to keep the surround shape stable during storage, handling and assembly. If your card de-lams nicely, leave it and reuse it. The thickness is not critical. If it comes away from the surround then you'll have to make up a new card or paper ring for re - assembly. Wire tables will include an ohms/metre figure. All you need to do to get the total resistance is calculate the length of wire needed to wind a 2 layer cylinder of appropriate dimensions. Use a spreadsheet like Excel for your calculations. It will be easier to step through the available wire gauges in that way. You can assume zero clearance between turns and layers but do allow for the enamel coating to get winding length from the number of turns. The nominal wire size is the uncoated copper diameter.